« Oh No…the Big East isn’t that Good? Do the Knicks Care About Winning? From the way the Knicks have been playing the last week and a half, it’s hard to believe they actually care about this season. Last year, I wasn’t angry at the Knicks’ miserable finish, given there was almost no talent on the squad. But this year, the Knicks have one of the most talented teams in the league. They’ve had a miserable March and have lost five of their last six games (losing to the awful Bucks and Pistons in the last two games). After playing like one of the best point guards in his first four games as a Knick, Chauncey Billups has returned from his injury as the softest player in the league. When the Knicks’ point guard is having eight turnovers a game, they won’t win. Plus, our back court is the worst in the NBA. They should just cut Sheldon Williams and Ronnie Turiaf now and play without a center for the rest of the season. I guarantee the Knicks would have more rebounds. And while we’re at it, let’s talk about D’Antoni. I hate to say it, but can he honestly lead this team to a championship? I’m starting not to believe it. It has been reported that Carmelo is not happy with his role offensely. The reason why the Knicks brought D’Antoni over from Phoenix was because of his brilliant offense. If this isn’t working, what is he good for? The defense hasn’t improved at all. If the Knicks continue this lazy losing streak and have an early exit in the playoffs, would it be a good idea to bring D’Antoni back? New York Nick mentioned to me that he wants Jeff Van Gundy back in New York as head coach. I couldn’t agree more. The guy knows how to get the most out of his players. If you look at the Knicks in the late 90’s, they didn’t have remotely the best talent in the league (Houston and Sprewell were good, but everyone else was past their prime). But Van Gundy was able to have his guys play their hearts out for him. I can’t say the same about D’Antoni. So as they head into the final games of the season, let’s see if the Knicks can get out of this slump. If I pwned the Knicks, I would fire D’Antoni at the end of the year if this slump doesn’t end. The Knicks is preaching about having patience. Shut the f*** up! You want to talk about patience? Try having a miserable basketball team for eleven years! This is the most talented team I’ve seen since 1994. But that 1994 squad had heart. This team doesn’t care about winning. They said it themselves. They’re waiting for next year, and that doesn’t work in this town. If they want to quit, get out. Let’s see if the Knicks can figure it out at home tonight against Boston. 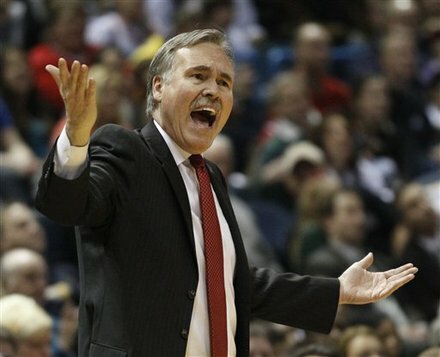 One more loss and let the “Fire D’Antoni” chants begin. This entry was posted on March 21, 2011 at 9:52 am and is filed under Knicks. You can follow any responses to this entry through the RSS 2.0 feed. You can leave a response, or trackback from your own site. When guys like Carmelo come out and say that they’re getting ready for next season, it’s a slap in the face to the fans who have watched them all year. This team is in 7th place and has a 99% chance of making the playoffs. There’s plenty of time left to figure it out but it looks like the players don’t feel that way.